injured/non-injured employees, health care providers, and the insurance carriers). CIW earmarked 6 objectives. questions answered. Other Town Hall Meetings and Seminars have been conducted periodically. without a home, a car, their family, and/or divorced. attorneys, healthcare providers, or any other special interest party. being. Some end up committing suicide. 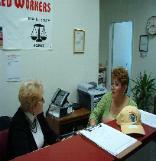 Center for Injured Workers, Inc.